I think its safe to say that at the beginning of every year we ALL try to clean up our diets. I'm no exception to that rule. However, many of us fall off the healthy eating wagon at about this time. One thing that that has helped me is meal prepping. I don't do this so much for dinner, but for breakfast and lunch, meal prepping is what keeps me on track. 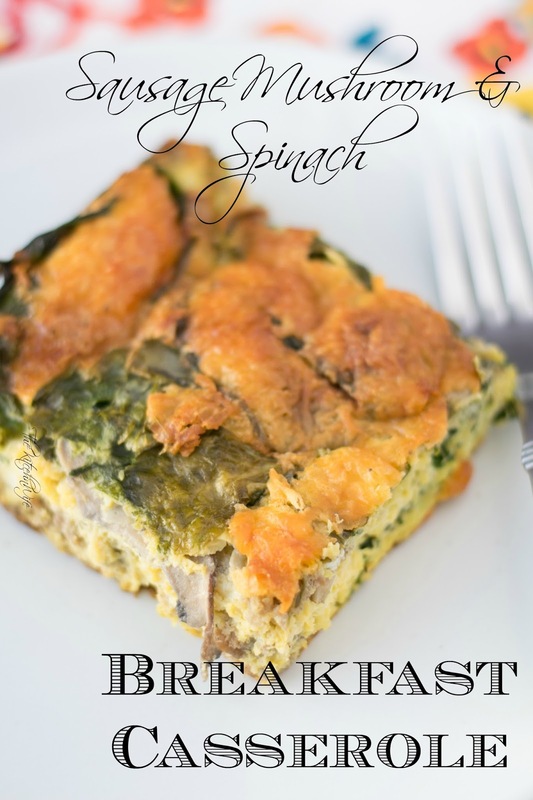 One of my favorite breakfast dishes to meal prep is my Sausage, Mushroom, and Spinach Breakfast Casserole Recipe. For this casserole you will need to fully cook the sausage so place a skillet over medium/high heat and allow it to get hot. Once the pan is hot add the sausage and let it cook until brown and no longer pink, about 10 minutes. While the sausage is cooking you can take the time to prep the vegetables. Once the sausage is fully cooked, you might as well add the onions, mushrooms, and green peppers to sauté a little. While the veggies are sautéing you can crack the eggs into a large mixing bowl. This next step isn't necessary, but I like to add a splash of milk to my eggs. To the egg mixture you will also add the seasoning salt along with a little pepper. Whisk everything together until golden and smooth. Now you will need to spray a 9x13 baking dish with cooking spray. Add the sausage, peppers, onions, and mushrooms to the baking dish. Top with the fresh baby spinach. Now pour the egg mixture over everything. Give the baking dish a little shake to make sure everything is coated in the eggs. Sprinkle to top with the cheese. You can use a little or a lot. The choice is yours. Place the Sausage Mushroom and Spinach Breakfast Casserole UNCOVERED in the preheated oven. And your casserole is done! I let it come to room temperature and then portion it out for the week. I absolutely this recipe and the best part is that you can tweak it any way you want. It's gluten-free, keto friendly, low carb, and can easily be vegetarian. 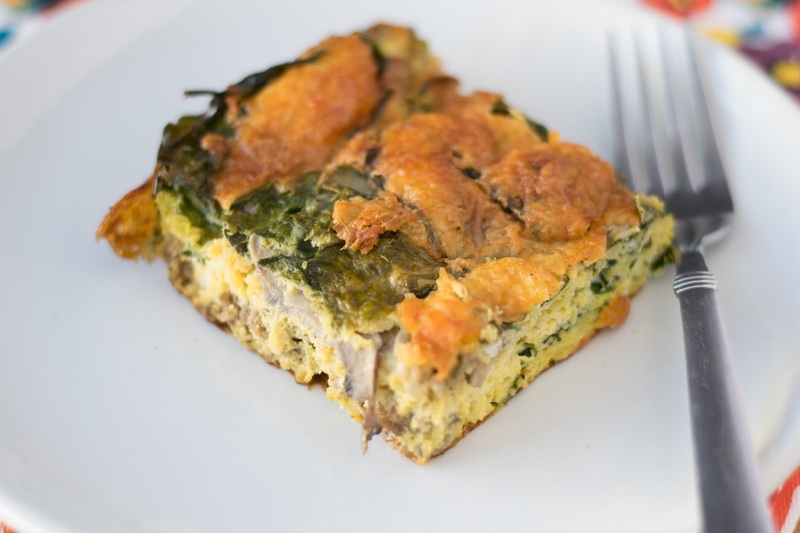 This Sausage Mushroom and Spinach Breakfast Casserole Recipe is a win-win for everyone! I know you are going to love it so give it a try TONIGHT! Place a skillet over medium/high heat and allow to get hot. Add the sausage to the hot pan and cook until brown and no longer pink. Add the chopped veggie to the pan, season with salt and pepper, and sauté for a couple minutes. In a large mixing bowl, crack the eggs, add a splash of milk, seasoning salt, and pepper. Whisk until golden and smooth. Spray a 9x13 baking dish with cooking spray and add the sausage and veg mixture. Top with the spinach and pour the eggs over everything. Give the dish a little shake to ensure everything is covered with the egg mixture. Sprinkle the top with shredded cheese and place UNCOVERED in the oven. At this point you can serve and enjoy OR allow to come to room temperature, portion out, and place in the refrigerator. I'm glad I've found your page. Your recipes are all healthy and delicious. Great job! Thank you so much! I appreciate all the love!